Users with all levels of GIS experience can participate in the design process. It pulls together different elements of the ArcGIS platform. The seven-step geodesign workflow forms the basis for configurable applications. Planning professionals across a wide range of industries must frequently weigh different variables against multiple scenarios to make a decision or recommend a course of action. A new web-based premium application—GeoPlanner for ArcGIS—delivers the power of ArcGIS Online and a geodesign workflow while enabling users across an organization or a community to collaborate on design decisions. GeoPlanner for ArcGIS, available in ArcGIS Marketplace, provides tools that support every step in a planning and design workflow: project creation, data identification and incorporation, scenario creation, site condition assessments, evaluation and comparison of alternatives, and reporting. Users are able to create, analyze, and report on alternative planning scenarios in support of better, more informed decision making. GeoPlanner for ArcGIS supports every step in the planning process, from project creation to planning, for a broad range of industries. Because it is accessed by a browser, the application provides a way for stakeholders both within and outside of an organization to participate in the design process. Planners, scientists, students, policy makers, analysts, and others, can use GeoPlanner regardless of their prior GIS experience. It is designed to be easy to learn and use by a wide range of non-GIS users and can be configured by GIS professionals in an organization. GeoPlanner can be used for a broad range of industries, from public safety to energy to natural resources. Sample configurations are provided through ArcGIS Online. These sample configurations illustrate features commonly used for land-use, public safety, and special event planning. Using ArcGIS for Desktop tools, these samples provide a starting point for GIS professionals to build on and create configurations that meet their specific needs. One of the powerful capabilities of GeoPlanner is weighted raster overlay. With it, users can overlay different information layers, weight the importance of each, and generate a web map displaying the results. The application allows values to be easily adjusted as users work through the design process and quickly generate multiple scenarios. 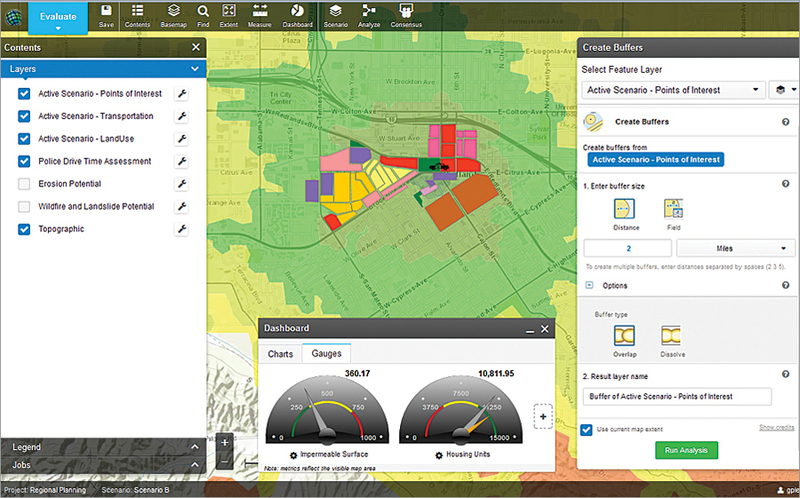 As part of the ArcGIS platform, the application integrates with a range of business tools, like Esri Maps for Office. For example, once users have worked through the design process and are ready to report their findings, GeoPlanner includes a Save Presentation button that creates a web map for the current view. Those maps can quickly be inserted into a PowerPoint presentation or used to develop a Story Map. One potential use, demonstrated at the Esri 2014 Federal GIS Conference, is locating drilling sites to minimize impact to sensitive wildlife habitat. Users can define prime habitat sites using weighted raster overlay with the landscape layers available in ArcGIS Online and then draw that into GeoPlanner to help guide and evaluate their proposed design. From there, each well site and road needed to support it can be plotted and visualized. The application allows users to repeatedly redraw roads and move sites. Pop-up dashboards provide a quick impact analysis and can be compared from scenario to scenario to minimize the environmental impact. For more information, go to esri.com/geoplanner.